Whether you�re new to the game and are looking for shuffleboard instructions, or you�re a seasoned player searching for shuffleboard tournament charts, we�ve got what you need to get your party started. Our line of scorecards, rulebooks and charts are perfect for any level of player and make great additions to your table. If you find you need any other shuffleboard supplies to get your game going like weights or wax, we�ve got those too! 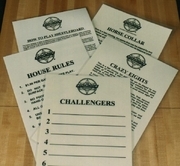 Our shuffleboard scorecards and shuffleboard tournament charts are reusable, for exceptional value. The laminated cards and charts can be written on with fine point dry erase markers from the store, and then wiped clean so they can be used again. Our rulebook selections feature both classic shuffleboard rules as well as additional fun games you can play on your table, like horse collar. They�re also full of useful information about leagues, scoring, and tips for maintaining your table. The wall sign rules are perfect for hanging in your game room as both art, and instruction to novice players on the rules and variations of shuffleboard.